It was good. It was sunny weather first two hours. I got 4 shinies. 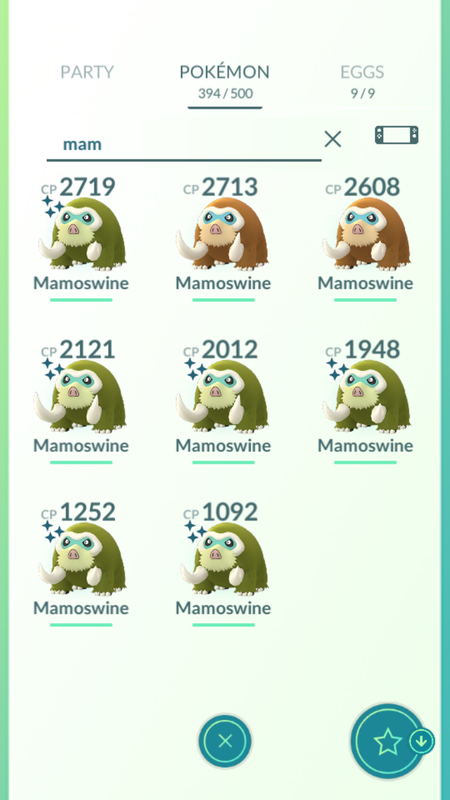 I evolved 8 Mamoswine. Just three. Called it quits early because of snow and that I already had a perfect one evolved. Do you think it’s worth burning TMs on the Mamoswine we evolved today? Pokegenie gives the Powder Snow / Ancient Power move set a rating of D for attack and D for defend, and every possible change for the charge move rates higher than the “special” move we got today. Impatience drove me to use a fast-move TM and charge-move TM, and now (with Mud Slap and Avalanche) it rates A/A. Much better. You want Powder Snow/Avalanche on them. Its the best ICE attacker in most cases, and it will destroy Rayquaza when it returns to raids. 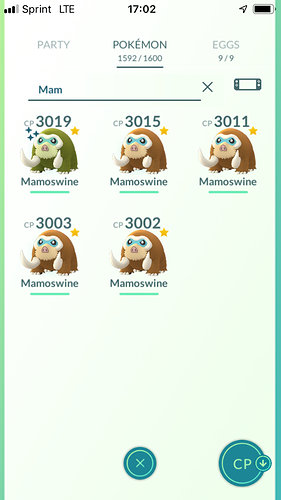 Ancient power is pretty bad on Mamoswine. Ive only made 1, and thats on 1499 CP for PVP. Everything else is gonna get the better moveset. So Mud Slap is ineffective against Rayquaza? Sorry… strayed off-topic with that one; never mind. That worked for me because I only had about 90 minutes to participate today. Ended up with 8 in total. Rather impressive shiny haul there, @Brobraam. Looks kind of like a page full of little watermelons. Spawn swarm! I suppose having a Pokemon Go Plus would be able to sweep 'em up in one swoop? Or 50% of 'em, anyway. I have got one for my daughter’s account within just 30minutes, then played my account for more than an hour without any luck. Visitors took also an hour out of my CD, the reason why I want CDs to be not in a weekend or better make it twice or thrice a day, one hour per session… Niantic pleeeeeeeaaaassseee??? Or even the whole weekend – like 5pm Friday to 8pm Sunday? What is the sum of all candies you obtained (without evolutions)? The badest for me… I got two Swinub with an incense, no shiny. And all because I was sealed in bed because of flu. So I evolutioned a 100%, level 40 I had in stock to have a Mamoswine with the special move. By the way, what with the special move of pokemons during CDs? are they the best moves for battling? or the most powerful one?